We offer Surgical Wash Basins to our clients. Microteknik are offering a wide range of Scrub Station hospital equipment. 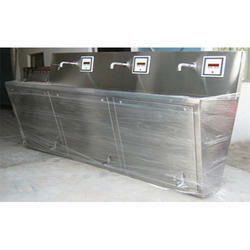 Since the commencement of our company, we provide the first class quality of SS Bedpan Sluice sink. Available with us in various technical specifications, these products are used in various hospitals and nursing homes. - CRCA tubular frame work mounted on 50 dia castor wheels. One bowl of 300mm dia. Manual or automatic operation with hot /cold water mixing. Accessories of knee/foot panel, soap dispenser, timeout control, sensors etc. MGI scrub stations have been designed to ensure that surgeons and staff can undergo a thorough aseptic scrub, whether using the count-stroke or timed scrub methods. Each fixture is fabricated from heavy gauge, type 304, stainless steel and is a seamless welded construction polished to a satin finish. Backed by huge industry experience and market understanding, we are involved in offering a wide array of Surgical Scrub Sink to our valued patrons. By understanding the needs of patrons, we are presenting a quality approved spectrum of Stainless Steel Scrub Sink in the market. The offered products are designed from high-quality steel. 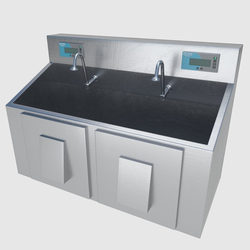 We offer a range of Hand Wash Unit which are extremely convenient to use. These are specifically designed for an anti-spill and non corrosive hand wash experience. It is deep enough and easily cleanable too.and wash unit is also made available in varying sizes if required by the client.